Note: Brought to you by Hacker in Residence, Sophi Kravitz! Have you ever wanted to control something just by thinking about it? Well, you're in luck. The MindWave allows you to turn electronic signals that flow in your body into digital signals that can be understood by a microcontroller. 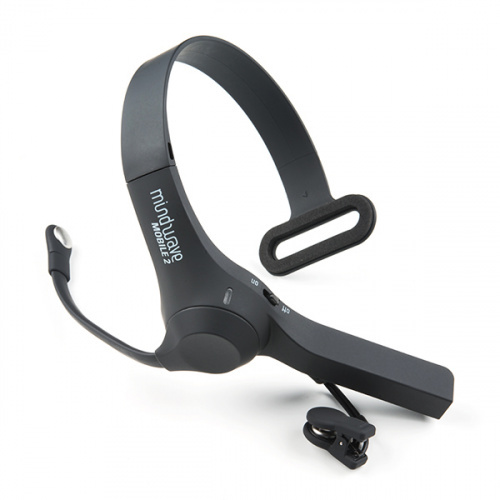 There is also the MindWave Mobile, which is designed to interface with your mobile devices. 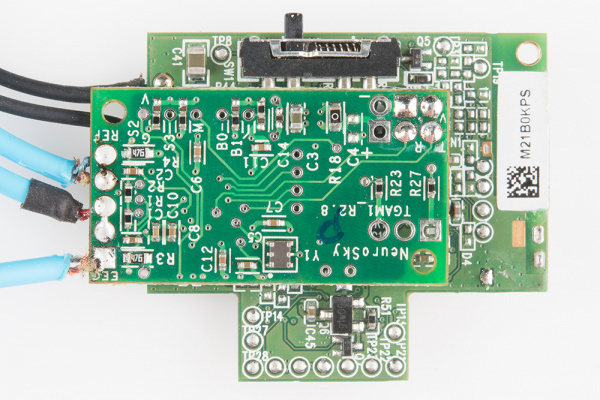 This tutorial will serve as half teardown/review and half project. After we explore the inner-workings of the MindWave Mobile, we'll switch gears and focus on hacking it. 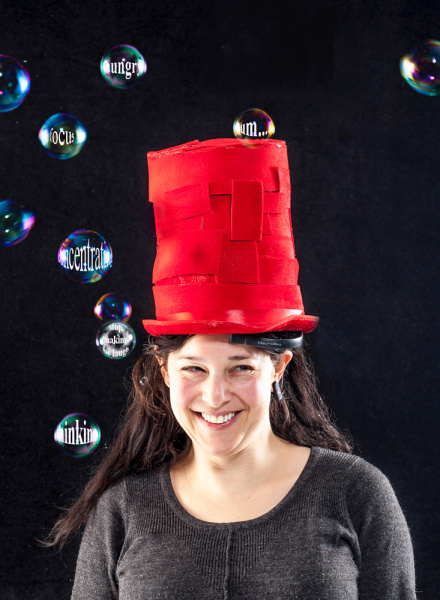 What is the data you will see coming out of the MindWave? What does it mean? This tutorial builds on some previously covered topics. Please visit any of the links below if you are unfamiliar with the concepts mentioned. What is the MindWave Mobile? To understand the MindWave and MindWave Mobile, we must first understand what an EEG sensor is. The first recording of the human brain's electric field was made by Hans Berger, a German psychiatrist, in 1924. Berger gave the recording the name electroencephalogram (EEG). Put simply, the EEG is performed by placing electrodes all over the subject's scalp, and then reading in the electrical signals for analysis. Fast forward to today, and you have all of this technology packed into a compact form factor that is the MindWave and the MindWave Mobile. The amplitude of the EEG is ~ 100 µV when measured on the scalp, and about 1-2 mV when measured on the surface of the brain. The bandwidth of this signal is from under 1 Hz to about 50 Hz. Because of the amplitude and low frequency of the brainwave signal, I was curious about how well a relatively cheap (~$100) sensor would measure brain signals. In this project, the analog brainwaves enter a processing ASIC chip and have digital values that are communicated over Bluetooth. I accessed only the digital data. It is certainly possible to look at the analog brain waves before they enter the processing ASIC, but it would be much more difficult, requiring a schematic and specialized oscilloscope probes. The Mindwave Mobile was chosen because because it uses Bluetooth, making it easier to interface it with a microcontroller or other hardware. 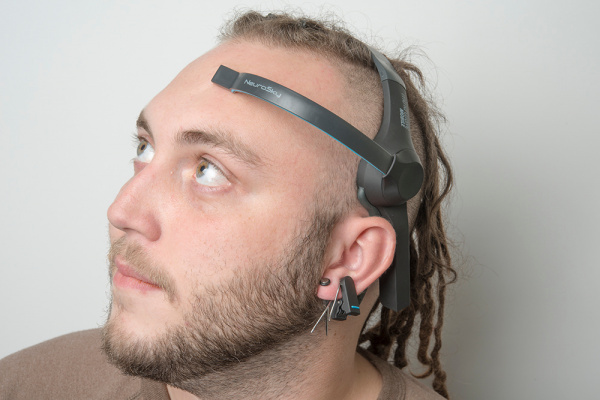 Please note that Neurosky has multiple models of the MindWave. SFE Creative Technologist, Nick Poole, sporting the MindWave. The electrode rests on the forehead, above the eyebrow, and the reference clips onto the ear. 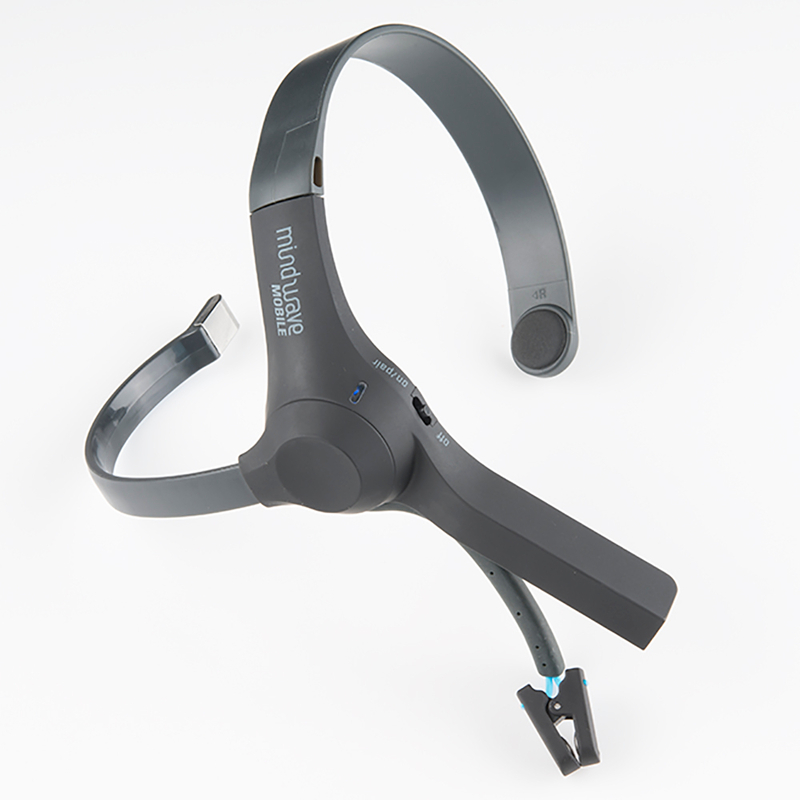 Pictured here is the MindWave headset. Nick Poole took one of these apart, so the insides of the headset are pictured here as well. 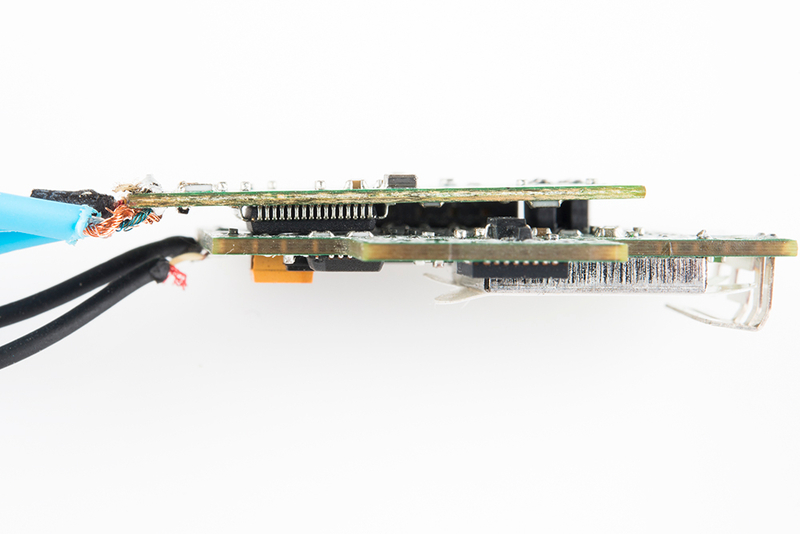 Here is a closeup of the internal circuitry. You may recognize the MSP430 hanging out at the top. In between the two boards is an ASIC. The ASIC on the Neurosky calculates a value for Attention and Meditation. It also processes five types of brainwaves (more on this shortly) and sends out unitless values for each one. This unit measures eyeblinks too. 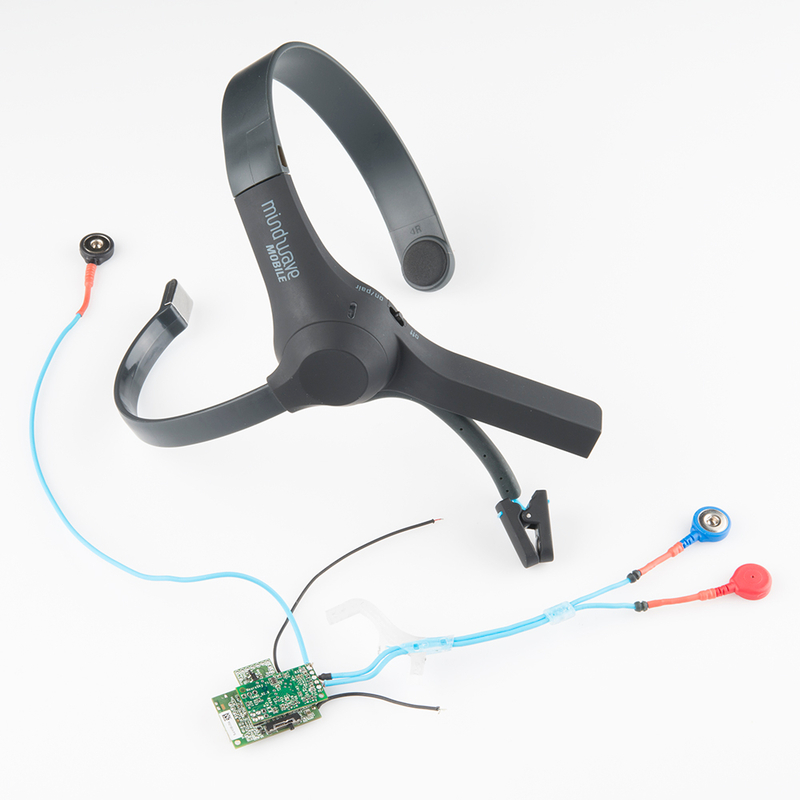 In order to interface with the MindWave, you'll need a few bits of hardware and software. To interface with the MindWave, the RN-42 Bluetooth module was chosen. For this project, I created a custom PCB, however, you could also use a BlueSMiRF or a Bluetooth Mate. 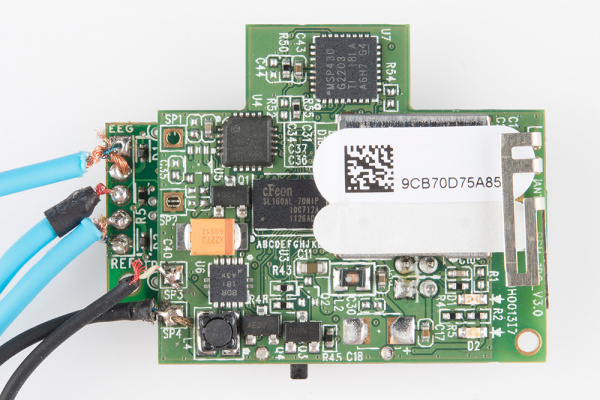 The Bluetooth module will be connected to an Arduino Uno to read in the data being transmitted wirelessly. 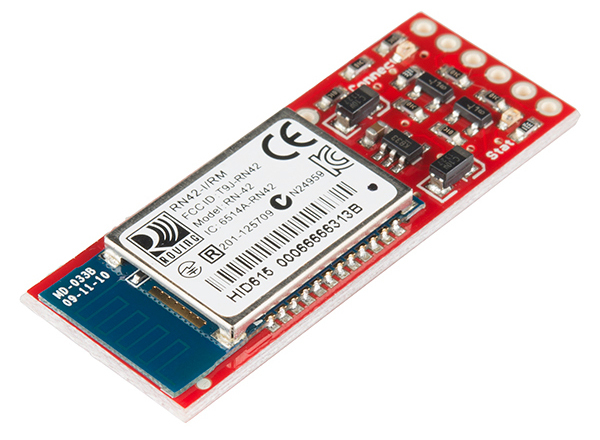 The BlueSMiRF Silver module from SparkFun. Once you've decided on which hardware you'll be using, connect everything. Again, the Bluetooth Basics and BlueSMiRF tutorials should cover how to do this extensively.